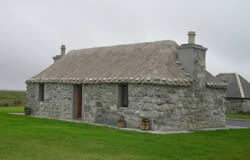 Luxury self catering accommodation set in the natural beauty of the hebridean island of South Uist. The cottage offers magnificent views of the hills of South Uist and the pristine white sandy beaches stretching along the west coast of South Uist is a 10 minute stroll away. It is the perfect location to unwind and enjoy the peaceful and scenic surroundings in this wonderful archipelago. The self catering thatched cottage is a Category B listed building by Historic Scotland which has been exteriorly finished to traditional standard but offers all modern facilities within. The vaulted ceiling living area is floored with solid oak and has a solid fuel burning stove which is ideal for creating a peaceful ambience. The luxury self catering accommodation has the latest technology including energy efficient LED TV , Sky+HD , blue-ray player, i-pod docking station and complimentary wi-fi internet access. Bathroom is equipped with a walk in rainhead shower and spa bath with chromatherapy features for the unique bathing experience. The vaulted ceiling bedroom has a solid wood four poster bed. Please see website for availability and booking.